Celia Pearce (1997). 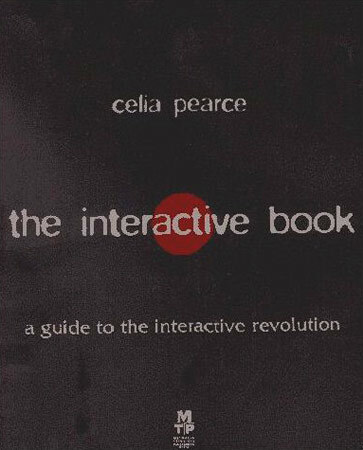 The Interactive Book. A participant dons an HMD and breath measuring apparatus to immerse himself in Osmose. In 1995, Char Davies unveiled the stirring Osmose. The only single-user experience of these nature-centered works, Osmose uses the metaphor of scuba diving as an interface into a virtual world. As with underwater diving, your breath controls your rise and fall in the abstract natural world, and gentle movements from side to side control your direction. It is a brilliantly simple device because it takes you into a parallel universe while at the same time drawing your attention back to your body and your breath. This scuba diving interface very effectively addresses two classic navigational problems with VR. First, it is a perfect way to deal with the problem of cumbersome HMD equipment—from the standpoint of a diver, heavy gear is a matter of course, and thus the awareness of it not only does not detract from the experience, but actually adds to it. Second, the scuba metaphor solves the navigational problem of the floor/walls/ceiling conundrum. Osmose is not a room, but a continuous space; it has no "ground" and so a walking paradigm would not work for its ethereal, floating spaces. Most VR spaces feature a floor, which means walking…or in the case of the HMD, walking in place. This can get very confusing to the user because it is giving a mixed message: walk/don't walk. Char's diving interface gives only one message: float. The result is that the visitor can be free of the mechanics of the device, and experience total immersion in the virtual world (see figure V.9). Osmose, as I mentioned, is one of the few VR worlds anywhere that has no floor. Like an underwater world, it seems to have no boundary, and leaves you with no clearly defined sense of scale. Osmose has been described as a meditation space. It is an abstraction of a natural environment, but it is deeply organic and in some way even sexual in its imagery. Small glowing, spermlike objects either fly or swim (you can never be quite sure which) among branching structures that could just as easily be arteries as trees; and a central tree-like structure suggests the Tree of Life; or it could be the central heart of a living organism (see figure V.10). Other environments intermingled with this world of swimming lights and quivering translucent leaves include a maze of code, and a poetry world consisting of pure text (see figure V.11). In Osmose, you can be a cell, or an embryo, a fish, or a bird, you can be inside it, or it could be inside you. Because it is a virtual space, it is undefined and unsealed and thus it becomes an aggregate of every level of scale, and of every natural process. In this way, it also bears a relationship to Charles and Ray Eames' classic film and book Powers of Ten, and T_Vision, the VR interpretation of a world at every level of scale, detail, and magnification. Osmose ends by pulling you out of the environment, a glowing seed, egg or cell, that you can see growing smaller and smaller as you move into darkness. Some describe the departure from it us a mournful exit from the womb; others left Osmose saying they no longer feared death. There is no question that for those who have embraced this mystical immersive experience, it is both cathartic and transcendent, a kind of digital nirvana, that takes people to a place they never expected to be taken by technology.